Bearhands can have really lousy timing. In one foul swoop (well, actually in lots of runs up and down the paddock) he’s has added a degree of difficulty to the school holidays: our entire farm is covered in chicken excrement. The odour is indescribable (at least on a website that values its G rating) and despite my reputation for being a hardarse, even I cannot order the children to play outside. But, my friends, this is not my first rodeo and after nine years of living on this sometimes stinky farm, I’ve learned the best way to combat smell is with smell. So I’m baking. Fight poo with cake or something like that. Parkin is a form of gingerbread which originated in Yorkshire in England. It always includes oats in the ingredients. It’s a proper, stick to your ribs kind of cake – golden syrup, ginger and rolled oats, what’s not to love? Preheat the oven to 180C. Grease and line a 20cm square cake tin. Combine flour and butter in a food processor and process until it resembles breadcrumbs. In a large bowl combine the sugar, ground ginger, bicarb and oatmeal. Add the flour mixture and stir well. Put the syrup and milk in a pan and mix together over a gentle heat. Add gradually to the dry ingredients, mixing well to a fairly stiff consistency. Put into the tin, smooth and bake for 45 – 60 minutes or until golden. Cool in the tin. When cold, mark out small squares by pushing a fork into the cake to make perforations. Turn out and break apart. 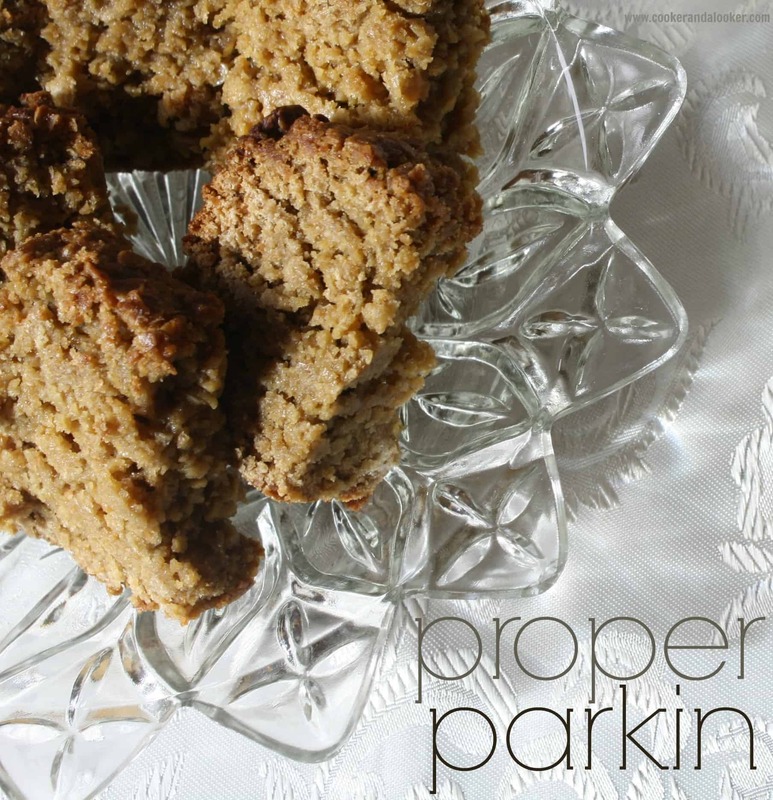 Whenever I make parkin I think it would have been a beaut smoko for hungry stockman – it’s a perfect accompaniment to a cup of tea and it’ll keep you going until lunch. Bearhands is headed away on Saturday for a boys weekend, so he won’t be home to enjoy the aroma. Unless it rains between now and then, I’m considering packing up the kids and abandoning the farm to its own odiferous devices. seriously though, how are school holidays treating you? Sounds like a great recipe. I am going to give it a try. After growing up in a street full of chicken farms I find that smell almost endearing now!! Ooh I like it. Maybe I will bake something to combat the horror that has been having the galloping trots whilst solo parenting two small children including one who also has the galloping trots. Good times. Oh wow – what a gorgeous looking cake! Will be putting this on the menu at our house. I used to work in a place that sold dynamic lifter – the stench was awful & I always felt like I was coated in it at the end of the day! Don’t envy you there!! Will have to bake this on my Monday baking day … Gav loves anything that has any ingredient correlation to ANZAC biscuits …. well truthfully anything with golden syrup. Sounds lovely can not wait to try it.